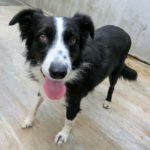 Jack is a lovely border collie (likely pure-bred, but who knows!). His foster mom is in love with him and wishes he could stay forever! Jack loves his people, but is less fond of existing pets. His foster mom feels that he would be ideal in a dog-free home: Jack has so much love to give, that he’d be best not sharing his humans full time. He is ok in many situations, but not full time. He is medium energy – loves his walks and loves lounging on the back deck. He is an amazing pup – as beautiful on the inside as he is on the outside.